May 1, 2014 — 2014 marks the beginning of a new program for Operation USA. In an effort to continue supporting under-served communities throughout the United States, OpUSA is expanding development programs to the Oglala Sioux Tribe on Pine Ridge Reservation in South Dakota. Jamaica Walden, Director of Operations, recently visited the Reservation. Read on to learn more about her experience there. I first learned about Pine Ridge Reservation from my father, Richard Walden, CEO of Operation USA. During the mid 70s, he was on the legal team that represented members of the American Indian Movement, an advocacy group that focused on Native American civil rights, during the occupation of Wounded Knee. My father had very fond memories of his time on the reservation. While there, he learned about the culture and history of the Oglala Sioux as well as various challenges the community faced as a result of its treatment by the federal government for more than 150 years. These challenges—high unemployment, limited access to adequate healthcare, and lack of opportunity within the boundaries of the reservation—still exist today. We arrived in South Dakota on the final day of a week-long snow storm. With winter weather lasting well into late spring, heat and proper winterization are a luxury for many on Pine Ridge, and propane costs are at an all-time high. Sadly, a woman on a nearby reservation had frozen to death only weeks prior to our visit. After speaking with members of the community, it became clear that tackling the issue of heat is a priority and will continue to be one every year as weather patterns become more extreme. Thus, Operation USA’s first project was identified. We soon provided the financial resources necessary to cover heating and propane costs at the Suanne Big Crow Boys and Girls Club (see below), and we are currently in the process of acquiring a large number of portable heaters that will be distributed by the tribe to residents before the cold season returns later this year. When we decided to work in Pine Ridge, we did a lot of research on the issues youths are currently facing on reservations, with the hope of finding one or several projects aimed at dealing with these issues in insightful and effective ways. While the statistics are discouraging (higher than average rates of depression, suicide, drug addiction and high school drop outs), we found individuals within the community who effectively combat these problems by providing Sioux children with hope for a brighter future. Leading by example, they inspire and motivate young people, driving them to seek out opportunities and make lasting, positive changes to the status quo on the reservation. 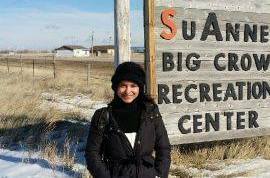 Susan and I were excited to visit the Suanne Big Crow Boys and Girls Club after hearing about the legacy of its namesake. Suanne, a star high school basketball player on the reservation, died at 17 years old in a car accident–but, while alive, she vowed to one day create a place where children could play and learn in a safe and positive environment. She believed that the key to uplifting the community would come from young people like herself who didn’t rely on others (ie. the government) for support, instead actively seeking opportunities to make a difference. Suanne’s mother Chick has since dedicated her life to continuing Suanne’s legacy by creating the Club, and with the help of Suanne’s extended family, Chick continues to run its various programs in a state-of-the-art facility. Activities offered include tutoring; swimming, basketball, and other athletics; computer, art, and music classes; livelihood training for teens entering the workforce, and a feeding program. For many children on the reservation, the Club is the only place they can go to participate in such a wide variety of programs and services. In addition to providing the resources necessary to keep the facilities heated during the winter months, Operation USA is now supporting the Club’s job training program for teens. This curriculum-based program tackles the high unemployment rate on Pine Ridge Reservation by offering teens training sessions on a variety of work-related topics, including time and financial management, resume and cover letter writing, and interview skills. Operation USA plans to continue its partnership with the Suanne Big Crow Boys and Girls Club by providing additional financial and material support in the future. Health statistics on Pine Ridge Reservation are similar to those we’ve seen in many of the developing countries where we work, and Shannon County (located within Pine Ridge) ranked the lowest county in the state for health outcomes last year. The infant mortality rate is five times the national average, while diabetes rates are 3-4 times higher, and life expectancy is significantly lower, than both the national average and that of the overall native population in the US. While the mortality rate for American Indians is 20% higher than the national rate, Pine Ridge has the highest rate among the native population, and heart disease as the leading cause of death. Given Operation USA’s history of assisting healthcare providers in under-served communities, we decided to meet with staff at the Oglala Sioux Health Administration to learn more about their immediate needs and discuss partnership areas. While the Indian Health Service provides healthcare to native communities on behalf of the federal government, it is underfunded and therefore limited in the type of care it can offer. The Health Administration, which is run by the tribal government, is trying to fill the gaps through a variety of programs, many of which focus on preventative healthcare, which is not readily available to members of the tribe. Services provided by the Health Administration include a mobile health clinic for immobile tribal members and health education aimed at a number of issues, including the prevention of fetal alcohol-exposed pregnancies, HIV prevention, and dental care. Currently, Operation USA is in the process of acquiring and delivering a large container of medical equipment and supplies to the Health Administration in an effort to meet its material needs. We will offer additional material and financial support as this partnership grows. After such an informative visit with the people of Pine Ridge, we look forward to working with Chick and others to help meet the various needs of the reservation’s population. OpUSA relies on support from donors like you to make programs in Pine Ridge, and around the world, possible. To get involved with a financial gift today, click HERE.